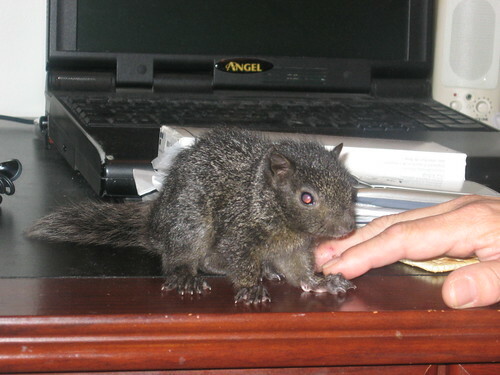 This cute and friendly squirrel belongs to my brother's friend name Tony. It was weird but this wild animal always follows and wanted to be with him. At first he was just setting on the steps at the backyard and this squirrel came up and cuddled beside him. It's very unusual for a wild animal to act that way but it really happens. This animal is very friendly and love to stay inside the home and play at the backyard. Last week Tony bought a new Toyota car and plan to apply for the best auto insurance quotes that found at insurancebureau.com. It's the most affordable life insurance quotes not only for my brother's friend but to all the people who needs security in the future. It is very important you can not drive in the street without car insurance. Again, to become safe and secure apply car insurance online. I can not get over how domesticated?? What a cute wee squirrel! Totally cute and so tiny!!!!! Well that's an interesting story indeed. A squirrel who chooses to live with people! Wonderful. Norm: That was a neat post but was the ad necessary in the middle. It must have been a fun and personal experience to be so close to Nature and to make a new wild critter friend. That is SO awesome! I would love to have an experience like that. Unusual indeed. Maybe someone had already tamed him. He so cute. That's weird. Squirrel are scared of people. Wonderful photos! When I was a child, I had a similar experience with a red squirrel. I always called him Perry, but I can't remember why. I've never seen a pet squirrel before! Great photos. I have never see a black squirrel in person. But I have raised and released 3 Grey ones. The are so muck fun. This is my first time on Camera critters. Wild and so tame, maybe it is an escaped pet ? Anyway, it is very very cute. Very cute! I've never heard of a tame squirrel before. How cute! I didn't realize they make good pets. what a cute little squirrel!